I still use and enjoy the first two Missouri Meerschaum cobs I ever bought years ago. One came from my local Tinder Box, the other a Walgreens in a nearby Nevada township that was clearing them out for fifty cents. 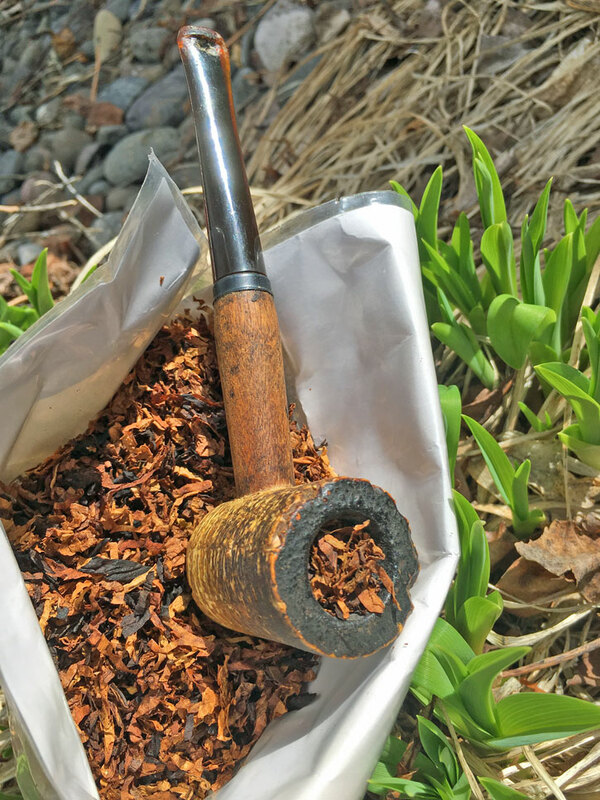 I had forgotten to bring my pipes at that time, as I was hired to do a mining claim staking job, but remembered my tobacco—an English blend of some sort. This time, the pipe mentioned above appeared like lost things tend to, when you least expect them and certainly when you aren’t looking for them. 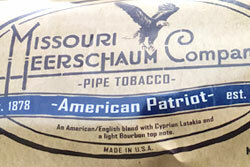 This final review of a trio of tobaccos bearing the Missouri Meerschaum brand is called American Patriot. This is a self-proclaimed American/English blend. As with the other two I have written about, the tobacco comes in a clear plastic-lined paper pouch, contains a decent portion of Cyprian Latakia, and claims to have “…a light bourbon top note.” I suppose the spirit of the name and the blend is a nod at political and social history of the American past, being a unique amalgamation of otherwise traditional things. No doubt I was happy I found my own historical piece, my nearly decade old cob pipe for which I’ve fixed, pipe-mudded, and replaced countless stems. 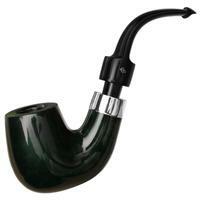 This pipe brings back good memories and is a testament to a great product I enjoy. It was one of the more appropriate vessels to explore MM’s American Patriot. 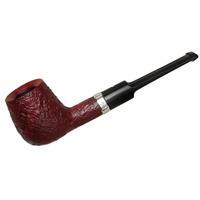 Of the three Missouri Meerschaum tobaccos I’ve gotten to know, American Patriot was the driest. It could have been packaging or the nature of the mixture. Regardless, I enjoyed this aspect of it as I find English-type tobaccos to respond well to drier conditions. The tobacco is cut into ticker ribbons, smell damn pleasant in the pouch, and never became troublesome to load in any given pipe. It lights effortlessly, tamps evenly and smiles gently with personality. The first few puffs tend to “cook off” quite a bit of the Latakia, and that gives the smoke a real kick of the signature campfire-esque nature celebrated by those who are a fan of the genre. It does take over the mixture for a minute or two, but eventually mellows into a more balanced experience. If the bourbon top-note is of any concern to any reading this, fear not: I personally never found it to be much more than barely a passing hint and inconsequential. The mid-point of a bowlful of American Patriot can be the least eventful. If smoked too fast, either due the dryness or nature of the burley I sense in the background, there’s a bit of bite and tongue fatigue that can sneak in. Without this however there’s a toasted seedlike attitude, which goes nicely with the bright nature of some of the included Virginia. The end of the bowl is my favorite part of this mixture. Any of the intended flavor, such as the constraints of making it an English or combining aspects of it being a Virginia/burley tobacco escape into something different. It’s a rebellious feat, as the Latakia shies away, the topping is a distant memory, and the flavors go into a savory and herb-like freshness. Whether or not this was intended or by accident, or even if it’s simply my tongue and palate, I enjoyed the change. It depended upon size of the bowl at times, but it wasn’t an anomaly. My summary is in two parts. 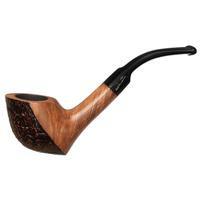 The Missouri-Meerschaum tobacco offerings are sound and solid. 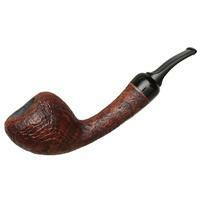 They’re a good value and certainly have the quality and selection to satisfy most smokers out there. American Patriot isn’t going to become my new English top choice out there, yet it managed to find a way to be different in a genre that has been done and redone many times over. Light to moderate in nicotine, bold enough to be interesting and simple enough not to be pretentious, I can vouch for it being a well-rounded smoke. As with the others in this lineup I have tried, it’s a good travel or camping tobacco. It’s a good yard work puffing tobacco. I wouldn’t pair it up with your $20/lb single origin coffee, a Yunan province aged tea or the best scotch, but if you wanted to crack open a Coke or a cheap beer you’d be a happy puffer. 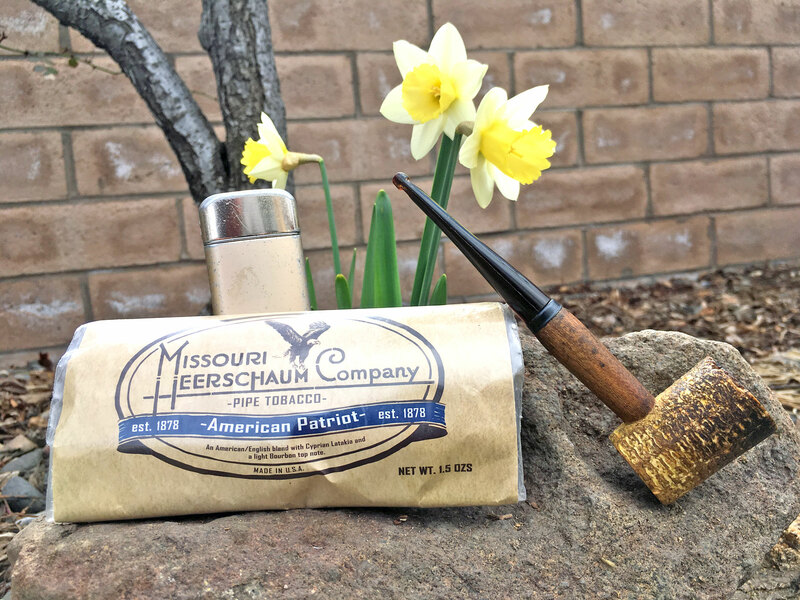 I’ve been curious about the Missouri Meerschaum blends, and this review answers some of my questions. In this same Americana niche are tobacco’s such as Iwan Ries Three Star Blue, Edward G. Robinson, and various U.S. pouch tobaccos like Granger and Five Brothers. 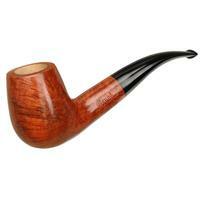 This MM series seems to have a good range on what smokes well in a MM cob.